Brain Stem: The brainstem also has known as brain stem is the back part of the brain, joining and structurally continuous with the spinal cord. In the brain, brainstem comprises the midbrain, the pons, and the medulla oblongata. The brain stem performs the motor and sensory innervation to the face and neck through the cranial nerves. Regarding the twelve pairs of cranial nerves, the ten pairs come from the brainstem. This is an extremely valuable part of the brain as the nerve connections of the motor and sensory systems from the central part of the brain to the rest of the body reach through the brainstem. This comprises the corticospinal tract (motor), the dorsal column-medial lemniscus pathway ( vibration sensation, fine touch, and proprioception), including the spinothalamic tract ( temperature, pain, itch, and crude touch). The brainstem further performs an important role in the regulation of cardiac and respiratory function. The brainstem additionally regulates the central nervous system and is crucial in maintaining consciousness and controlling the sleep cycle. The brainstem provides multiple fundamental functions including heart rate, breathing, sleeping, and eating. Midbrain: Midbrain also called mesencephalon, that is composed of the tectum, tegmentum, and the ventral tegmentum. The midbrain serves important functions in motor movement, particularly movements of the eye, and in auditory and visual processing. It is positioned within the brainstem and between the forebrain, and the hindbrain. The midbrain is the tiniest of the three areas of the brainstem, averaging around 2cm in length. The tectum comprises the inferior and superior colliculi and dorsal covering of the cerebral aqueduct. The inferior colliculus is the main midbrain nucleus concerning the auditory pathway and gets input from several peripheral brainstem nuclei, as thoroughly as inputs from the auditory cortex. Superior to the inferior colliculus, the superior colliculus signifies the rostral midbrain. The superior colliculus is committed in the special sense of vision and transmits its superior brachium to the lateral geniculate body of the diencephalon. The tegmentum of the brain stem which makes the floor of the midbrain and this part is ventral to the cerebral aqueduct. Numerous nuclei, tracts, and the reticular formation are carried here. The ventral tegmentum is included in paired cerebral peduncles. These transmit axons of upper motor neurons. Pons: The pons is the part of a brainstem and lies inferior to the midbrain, superior to the medulla oblongata and anterior to the cerebellum. This the region of the brainstem comprises neural pathways and tracts that transfer signals from the brain down to the cerebellum and medulla and tracts that transmit the sensory signals up into the thalamus. The pons measures about 2.5 centimeters (0.98 in) in length in humans. Most of it resembles a wide anterior bulge rostral to the medulla. Posteriorly, pons consists chiefly of two pairs of thick stalks designated the cerebellar peduncles. They attach the cerebellum to the pons and the midbrain. The pons comprises nuclei that transmit signals from the forebrain to the cerebellum, accompanying with nuclei that deal principally with sleep, respiration, swallowing, bladder control, hearing, taste, equilibrium, eye movement, facial expressions, facial sensation, and posture. Inside the pons is the pneumotaxic center consisting of the subparabrachial and the medial parabrachial nuclei. This center controls the change from inhalation to exhalation. The pons is connected to sleep paralysis, and may likewise play a role in generating dream. Medula: The medulla also has known as the medulla oblongata is placed in the brainstem, anterior and somewhat lower to the cerebellum. The medulla is a cone-shaped neuronal mass adapted for autonomic functions ranging from vomiting to sneezing. The medulla oblongata comprises the cardiac, respiratory, vomiting and vasomotor centers and consequently deals with the autonomic functions of breathing, heart rate, and blood pressure. 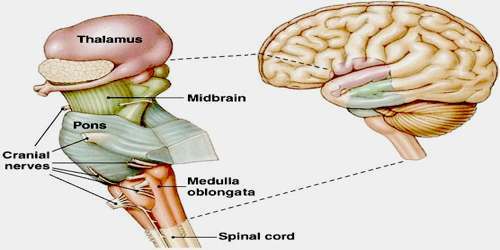 Throughout embryonic development, the medulla oblongata develops from the myelencephalon. The myelencephalon is a secondary vesicle which makes during the maturation of the rhombencephalon, likewise suggested to as the hindbrain. The bulb is an archaic term for the medulla oblongata, can refer to the nerves and tracts attached to the medulla, and also by association with those muscles innervated, such as the tongue, pharynx, and larynx. The brainstem performs a function in conduction. All information transferred from the body to the cerebrum and cerebellum and vice versa must traverse the brainstem. The ascending pathways becoming from the body to the brain are the sensory pathways and include the spinothalamic tract for pain and temperature sensation and the cuneate fasciculus for touch, proprioception, and the dorsal column-medial lemniscus pathway including the gracile fasciculus pressure sensation. The cranial nerves III-XII emerge from the brainstem. These cranial nerves supply the head, face, and viscera. The first two pairs of cranial nerves originate from the cerebrum. The brainstem functions being involved in respiratory control, cardiovascular system control, pain sensitivity control, alertness, awareness, and consciousness. The brain stem damage is really serious and usually life-threatening problem. The brain stem carries information among the peripheral nerves and spinal cord to the upper portions of the brain. Brainstem injury caused by trauma or stroke can commence to troubles with mobility and movement coordination, such as walking, writing, and eating become difficult and the individual may need life-long treatment. Stroke that happens in the brainstem causes the destruction of brain tissue that is needed for the direction of vital body roles such as respiration, heart rhythm, and swallowing. A stroke transpires while blood flow to the brain is disrupted, most usually by a blood clot. While the brainstem is damaged, signals among the brain and the rest of body are interrupted. Brainstem stroke can cause breathing, heart rate, hearing, and speech problem. It may further induce paralysis of the arms and legs, as thoroughly as dullness in the body or on one side of the body. Brain stem stroke can further cause double vision, slurred speech and diminished the level of consciousness. Risk factors for brain stem stroke are high blood pressure, diabetes, heart disease, atrial fibrillation, and smoking.